It's my life: Hieper de piep hoera! Big congratulations to my big boy Etienne who's birthday is today and my biggest little boy Camiel who's birthday was yesterday, he is 6 years already, his birth 6 years ago I remember it like it was last week. 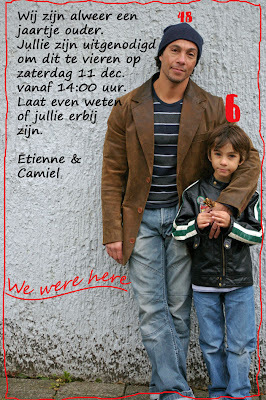 This was the invitation we sent for the part last saturday. These weeks are really busy. Tomorrow we have the kidsparty for Camiel we go to Piratenland (indoor playground) in Gorinchem (hope the weather will be ok, no snow please!). And of course all the christmas celebrations. Thursday Camiel has christmasdiner on school in the evening. Gefeliciteerd, gefeliciteerd!!! Dubbelop feest! (En mijn moeder wordt vandaag 70 - nóg meer feest!) Geniet van de dag!! !